Live Cattle appear to have seasonally topped out in the near term. Most of the calls for 145 have gone silent. I still feel that the market will challenge the old highs before the spring beef market has concluded. The market is now in an oversold condition. I still view this as a correction to a minor bull market, encapsulated within a major bear market which started in mid-2015. Hedges for LIVE Cattle have been rolled down aggressively, financing or extending the life of the hedge. I recommend letting all hedges work from here forward, in case my analysis is wrong, and would not look to roll down again until we can work a 1:3 or 1:4 ratio. Feeder Cattle have a substantial amount of seasonal upside left to them (May – June). That’s relative to time, not necessarily to price. The need for a corrective pull back has been satisfied. Similar to Live Cattle I view this as a correction to a minor bull market, within a major bear market. Hopefully our minor bull market didn’t just die. All hedges have been rolled down covering the premium. As in live cattle I would let all hedges work from this point on, not rolling down again until we can achieve 1:3 or 1:4. Bear in mind it is quite normal, seasonally, for feeders to sell off some the end of March. Matching or setting yearly lows would be alarming and not normal. May feeders pushed into topside resistance at 166 and sold off. The selloff has extended below all the Fibonacci retracement levels and after nearly limit down on Wednesday, threatened the bottom supporting trend line (in blue on the chart). Thursdays reversal and limit higher action lends credibility to the correction being complete. The market needs to extend higher in the near term. 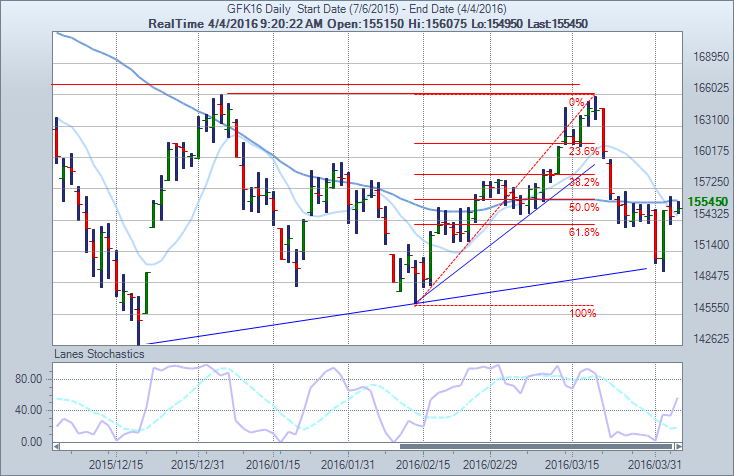 A trade below the Reversal low of 159.575 cancels the reversal and the uptrend line (in blue) on the May chart. Short term trend is still up, but has been staggered. As mentioned above, the market challenged this trend line (in blue) and turned back higher. Moving averages have crossed back over to marginally negative. If the market selloff is extended this will become significant. After that we have support at 146.65. All options have been rolled down covering the cost of the hedge. As we are using house money at this time, I will be letting my hedge work, and not looking to take profit to the down side until we can work a 1:3 or 1:4 ratio. I would recommend starting to process your decision IF the market gets down to 142. Do you want to take the chance and roll 1:2 or slightly better again, or are you willing to risk a small hedge profit and let them work. Know that rolling 1:2 again around 142 and getting it wrong will start to have serious budgetary consequences. The preferred choice would be to roll options up at a 1:4 ratio, or better, as the market extends away from the trend line (in blue below). A PERSON CONTEMPLATING PURCHASING A DEEP-OUT-OF-THE-MONEY OPTION (THAT IS, AN OPTION WITH A STRIKE PRICE SIGNIFICANTLY ABOVE, IN THE CASE OF A CALL, OR SIGNIFICANTLY BELOW, IN THE CASE OF A PUT, THE CURRENT PRICE OF THE UNDERLYING FUTURES CONTRACT OR UNDERLYING PHYSICAL COMMODITY) SHOULD BE AWARE THAT THE CHANCE OF SUCH AN OPTION BECOMING PROFITABLE IS ORDINARILY REMOTE.